Parents say they are concerned about the safety of their kids due to the number of homeless residents that have taken over their neighborhood park. Austin Carter reports. Parents say they are concerned about the safety of their kids due to the number of homeless residents that have taken over their neighborhood park. 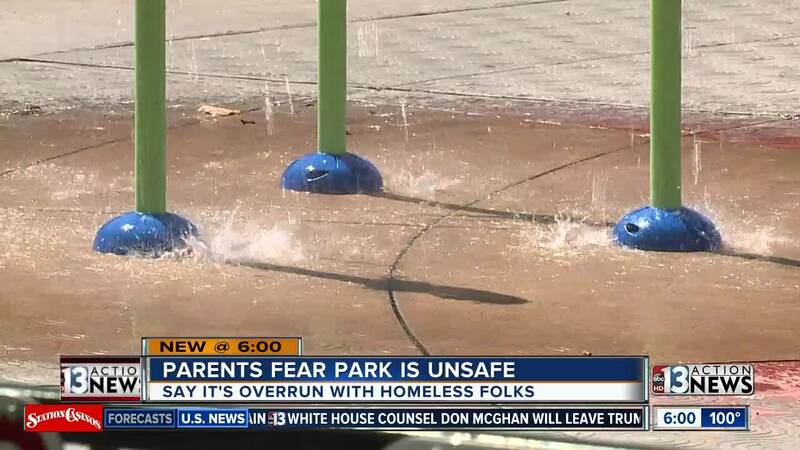 There's plenty for the family at Jaycee Park near St. Louis and Eastern avenues, but lately parents say they have been spending less time here because they feel unsafe. Concerned parents tell 13 Action News that homeless people have taken over most of the park. Many say they feel it’s unsafe for their kids. “I don't think it would be safe for my children with all the drug use and drug paraphernalia that's on the ground,” says one parent. Parents like Ashley Dines, who grew up coming to the park as a kid, say they’ve seen it all. She now frequents the park with her daughter, but says the final straw was when someone was shower in the splash pad in the middle of the day. "You can tell who is a parent and who is a homeless person and they didn't even have the common courtesy to say maybe this isn't the best time for me to rinse off,” says Dines. Dines says many call the playground and gazebos home. 13 Action News found blankets sitting right next to a playground staircase and many asleep in the grass. While our crew was at the park Wednesday, two city marshals showed up and frisked a man that was on the ground. “Say you have a teenager, I’m a small-framed woman myself and I don't feel comfortable going to the restroom because you don't know what you'll run into,” says Dines. 13 Action News took these concerns straight to the city. The city says Ward 3, the district the park falls in, has not received any official complaints about the issue. However, the city says the park is under watch by Las Vegas City Marshals. They are also urging folks who have any concerns or see something that isn’t right with any of the homeless residents to give the Las Vegas City Marshals a call.